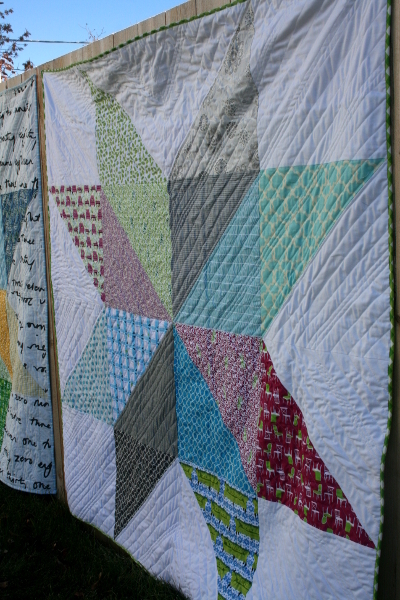 These two giant star quilts were made using Jeni Baker’s tutorial. They were among the gifts I gave my children for Christmas in 2013. 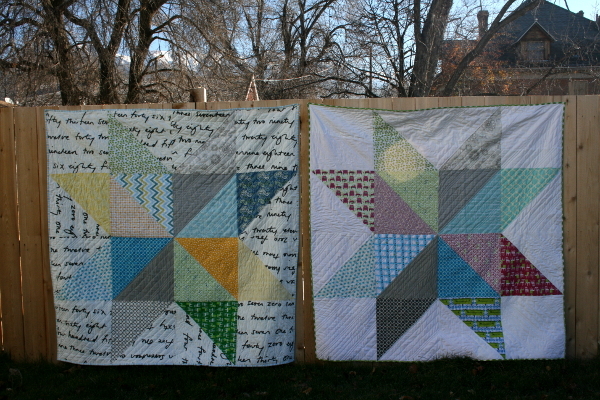 These two particular quilts were for my then 9 and 11 year old daughters, who share a room. I wanted them to have something similar that was also personalized. Each of them chose the fabrics for their quilts, so they enjoyed opening them on Christmas morning. The biggest difference between the two is my choice in background fabric. One was pieced with a solid white and the other with the IKEA Britten Nummer fabric. I like them both. 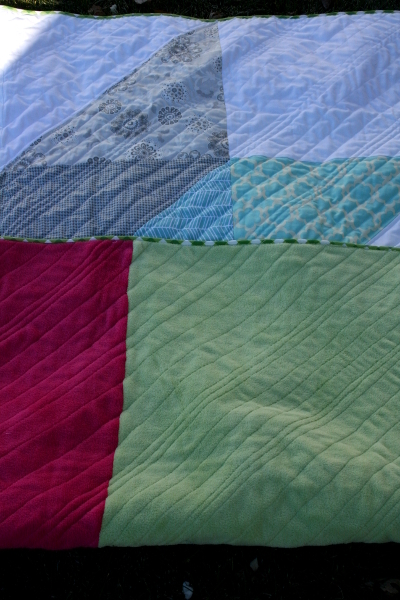 My favorite element in both quilts is the quilting. Again, I did straight line quilting. My lines are unevenly spaced but all form a V moving from the edge of the quilt with the point towards the center. 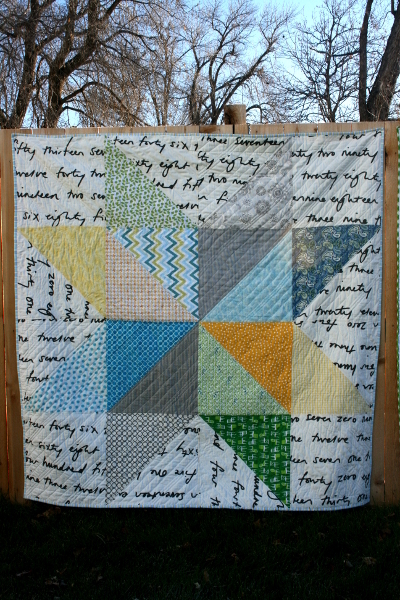 I like the way it enhanced the quilt pattern and helps provide beautiful texture after washing. Again, the quilts feature a simple minky backing to guarantee the approval of my girls. They were a hit and have been much loved over the past year. 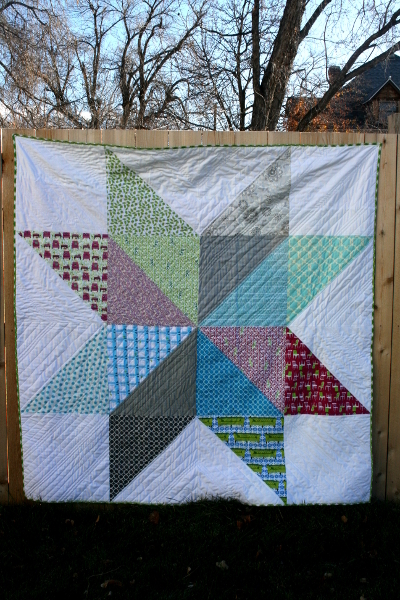 I can’t believe that 2014 has come and gone so quickly, as it doesn’t seem so long ago that I finished these quilts with a smile and a sigh of relief. A good reminder that 2015 will likely come and go in like manner.